Raumfahrt-Politik - Kehrt der Kalte Krieg im Weltraum zurück? Mars-Chroniken - Mars-Rover Curiosity macht Beste Sonnenfinsternis Fotos von Phobos! Mars-Chroniken - Kam das Leben auf die Erde vom Mars? Astronomie - Wissenschaftler haben magmatisches Wasser auf der Oberfläche des Mondes erkannt. The EUTELSAT 25B/Es’hail 1 container is rigged for its hoisting from the unloading ramp to a flatbed trailer after arrival at Félix Eboué Airport in French Guiana. Once this action is completed, the satellite will be transferred by road to the Spaceport. 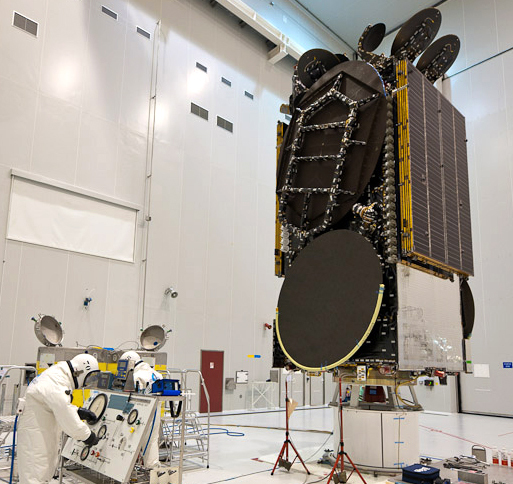 Payload preparations for Arianespace’s next Ariane 5 mission are moving into their full pace with the delivery of its second passenger – EUTELSAT 25B/ Es’hail 1 – to French Guiana, joining GSAT-7, which arrived earlier this month. The EUTELSAT 25B/Es’hail 1 spacecraft was transported to South America aboard an Antonov An-124 cargo jetliner, which landed on July 27 at Félix Eboué Airport near the French Guiana capital city of Cayenne. After the unloading process – aided by the giant aircraft’s tilt-up nose and its forward “kneeling” capability – the protective container with EUTELSAT 25B/Es’hail 1 was readied for transportation by road to the Spaceport, some 65 kilometers away. Built by SSL in the U.S., this satellite will assist European telecommunications operator Eutelsat and Qatar’s Es’hailSat satellite company in responding to demand for the fastest-growing applications in the Middle East and North Africa – including video broadcasting, enterprise communications and government services. In addition to securing Ku-band continuity for Eutelsat and additional Ku-band resources for Es’hailSat, EUTELSAT 25B/Es’hail 1 will initiate a Ka-band capability that opens business opportunities for both parties. The spacecraft is based on SSL’s proven 1300 satellite bus, and will provide a follow-on to the EUTELSAT 25C satellite, which currently is operated at 25.5° East. Liftoff mass of EUTELSAT 25B/Es’hail 1 will be more than 6,000 kg. Located below it will be the Indian GSAT-7 telecommunications satellite, which arrived in French Guiana on July 11 and has been undergoing checkout in the Spaceport’s S5 payload preparation facility. With an estimated liftoff mass of 2,650 kg., GSAT-7 was developed by the Indian Space Research Organisation and carries relay payloads in UHF, S-band, C-band and Ku-band. GSAT-7 and EUTELSAT 25B/Es’hail 1 will be lofted by Flight VA215, as designated in Arianespace’s launcher family numbering system, signifying the 215th mission with the Ariane series of launch vehicles. It will be the fourth heavy-lift Ariane 5 mission in 2013, and follows last week’s on-target Flight VA214, which orbited Alphasat, the largest telecommunications platform ever built by Europe, along with India’s INSAT-3D meteorological platform – which uses the same basic spacecraft bus as GSAT-7. In addition to the three Ariane 5 liftoffs performed so far this year by Arianespace at the Spaceport, the company’s other launch vehicles also have been active. Its medium-lift Soyuz and lightweight Vega performed one launch each from French Guiana, while Arianespace’s Starsem affiliate conducted a Soyuz mission from Baikonur Cosmodrome in Kazakhstan. As a result, the combined flights of these three Arianespace family launchers have orbited a total of 18 payloads to date in 2013. 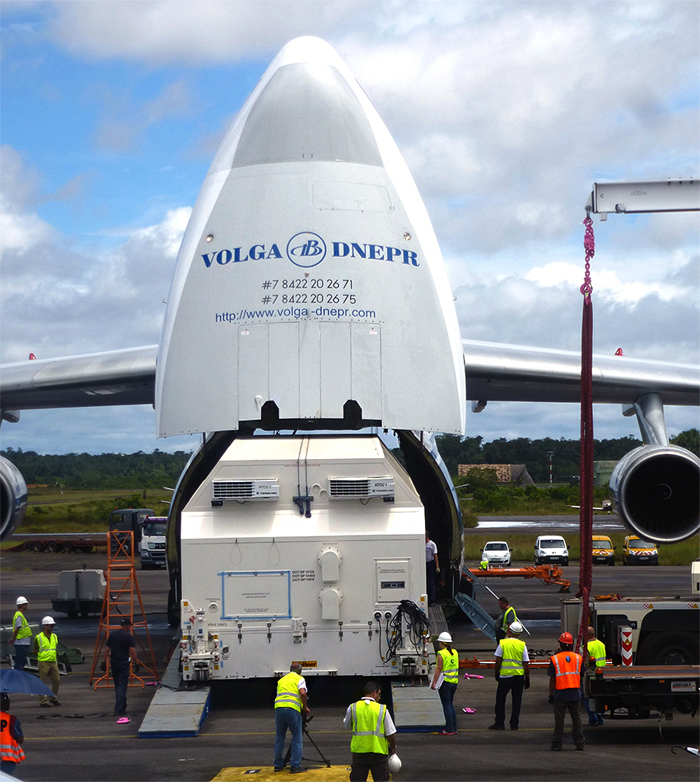 With the An-124 tilt nose opened and the jetliner in its “kneeling” position, the protective container with EUTELSAT 25B/Es’hail 1 is unloaded at Cayenne’s Félix Eboué Airport. EUTELSAT 25B/Es’hail 1 receives its fuel load in the Spaceport’s S5 payload preparation center as the satellite is readied for Arianespace’s upcoming dual-passenger Ariane 5 mission. Fueling is underway at the Spaceport with EUTELSAT 25B/Es’hail 1 – the largest of two satellite passengers for Arianespace’s next Ariane 5 mission, scheduled to lift off from French Guiana late this month. The satellite is being “topped off” in the S5A fueling and integration hall of the Spaceport’s S5 payload preparation center, marking another step in this spacecraft’s pre-launch processing. EUTELSAT 25B/Es’hail 1 was built by Space Systems/Loral (SSL) for two users: European telecommunications operator Eutelsat Communications and Qatar’s Es’hailSat Satellite Company; with the high-power, multi-mission relay platform to provide flexible coverage over the Middle East, North Africa and Central Asia. The satellite is designed to deliver television broadcasting, telecommunications and government services with its Ku-band payload, while Ka-band relay capability is included to open business opportunities for both Eutelsat and Es’hailSat. 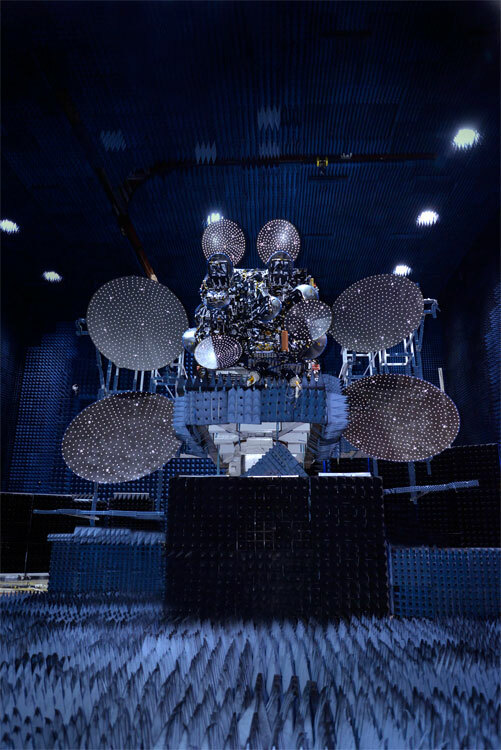 Based on Space Systems/Loral’s SSL 1300 spacecraft platform, EUTELSAT 25B/Es’hail 1 is equipped with four steerable spot beam antennas and four deployable reflectors, along with advanced command and telemetry capabilities. After deployment by Ariane 5, the satellite will be positioned at 25.5 degrees East longitude, with a designed operating lifetime of 15 years or more. 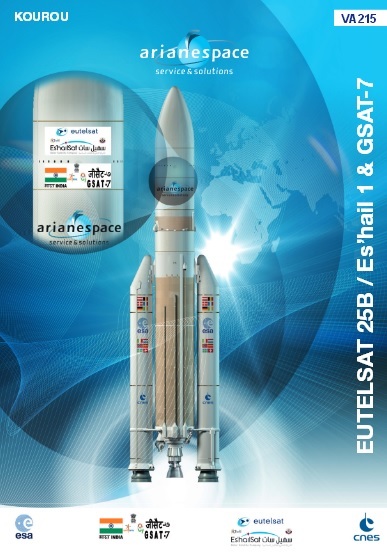 For Arianespace’s August 29 launch, EUTELSAT 25B/Es’hail 1 is to be installed in the upper position of Ariane 5’s payload “stack,” with the flight’s co-passenger – India’s GSAT-7 communications satellite from the Indian Space Research Organisation – riding below it. The lift performance on this fourth heavy-lift Arianespace mission in 2013 will be more than 8,550 kg., which includes the 6,000-kg.-plus liftoff mass of EUTELSAT 25B/Es’hail 1 and GSAT-7’s estimated mass of 2,550 kg. Designated Flight VA215 in Arianespace’s launcher family numbering system, the upcoming launch follows heavyweight Ariane 5 missions conducted so far this year from the Spaceport in July (Flight VA214, with Alphasat and INSAT-3D), during June (Flight VA213, orbiting the Automated Transfer Vehicle Albert Einstein), and in February (Flight VA212, with Amazonas 3 and Azerspace/Africasat-1a). In other 2013 Arianespace launch activity, the medium-lift Soyuz was deployed in June from French Guiana with four O3b Networks satellites, and the lightweight Vega performed a Spaceport mission in May with the Proba-V, VNREDSat-1 and ESTCube-1 payloads. Completing the company’s activity to date in 2013 was a February Soyuz flight from Kazakhstan’s Baikonur Cosmodrome, performed by Arianespace’s Starsem affiliate to loft six Globalstar second-generation satellites. 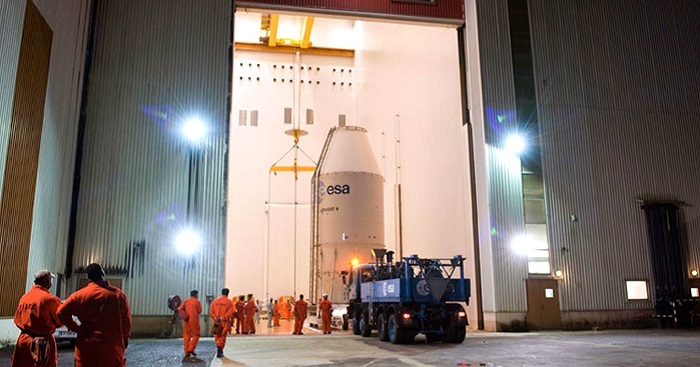 The protective container with GSAT-7 is moved into Ariane 5’s Final Assembly Building, where this Indian communications satellite was mated with its heavy-lift launcher. 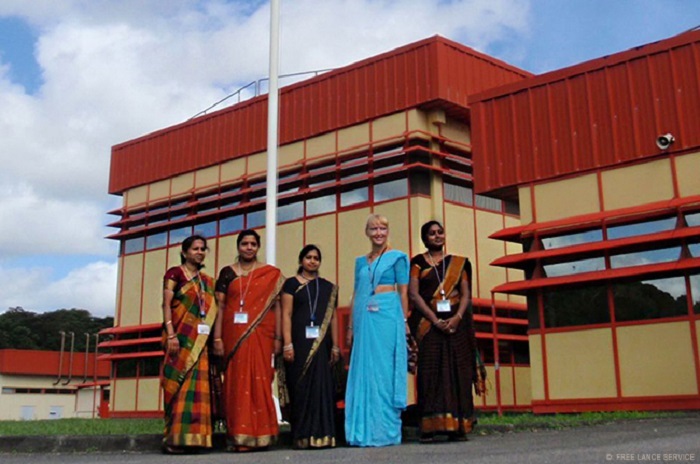 India was in the spotlight at the Spaceport in French Guiana this week as its GSAT-7 communications satellite was mated to the Ariane 5 for Arianespace’s August 29 launch, and mission team members gathered to celebrate the country’s Independence Day. GSAT-7 will provide relay capacity in UHF, S-band, C-band and Ku-band from an orbital position of 74 deg. East., with a liftoff mass estimated at 2,550 kg. Developed by the Indian Space Research Organisation, it utilizes India’s standard I-2K spacecraft bus – the same as for the country’s INSAT-3D meteorological satellite orbited on Arianespace’s previous Ariane 5 mission, performed July 25. Following GSAT-7’s integration on Ariane 5, members of the satellite team joined with Arianespace personnel to celebrate India’s Independence Day on August 15. As part of the observance, a flag-raising ceremony was held at the Spaceport’s S5 payload preparation facility, where GSAT-7 had undergone its pre-launch checkout and fueling. The August 29 mission with GSAT-7 will be Arianespace’s fourth Ariane 5 liftoff of 2013, and also will carry the EUTELSAT 25B/Es’hail 1 telecommunications platform in another of the heavy-lift launcher’s dual-passenger flights. A flag-raising ceremony in front of the Spaceport’s S5 payload preparation facility was part of the Indian Independence Day celebration with GSAT-7 mission team members and Arianespace personnel. EUTELSAT 25B/Es’hail 1 has been installed atop the SYLDA dispenser system during integration activity at the Spaceport, positioning this satellite for its ride as the upper passenger in Ariane 5’s payload “stack” for the August 29 Arianespace heavy-lift mission. This marks a new milestone in preparations for Flight VA215 from French Guiana, which will loft EUTELSAT 25B/Es’hail 1 and GSAT-7. Once in orbit, EUTELSAT 25B/Es’hail 1 will be used by two operators: the European telecommunications operator Eutelsat Communications; and Qatar’s Es’hailSat Satellite Company. As a high-power, multi-mission relay platform, the satellite is to deliver television broadcasting, telecommunications and government services with its Ku-band payload, while Ka-band relay capability is included to open business opportunities for both Eutelsat and Es’hailSat. It was produced by Space Systems/Loral (SSL) with a design operating lifetime of 15 years or more, and will be positioned at 25.5 deg. East after deployment by Ariane 5. EUTELSAT 25B/Es’hail 1 was installed on the SYLDA dispenser in the payload preparation area of the Ariane 5’s Final Assembly Building. With this step completed, the satellite/SYLDA combination is ready for encapsulation in the payload fairing, followed by integration on Ariane 5 – positioning it atop GSAT-7, which already has been mated to the launcher. 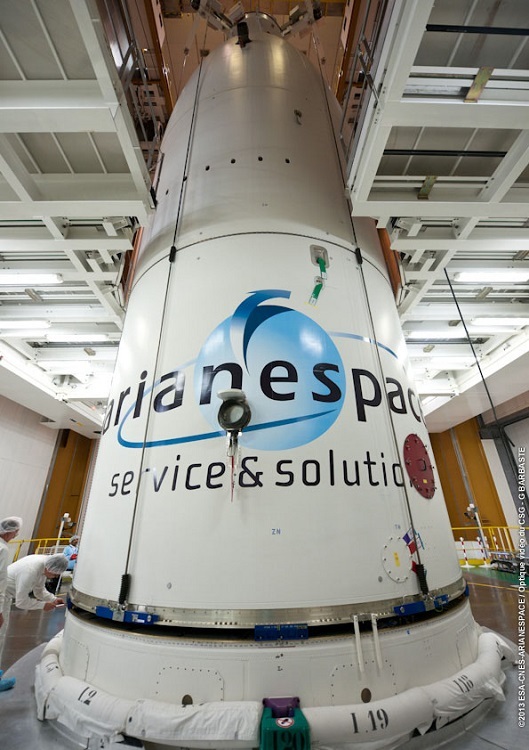 Flight VA215 will be Arianespace’s fourth heavy-lift mission in 2013 and the 215th launch of an Ariane-series vehicle from French Guiana. 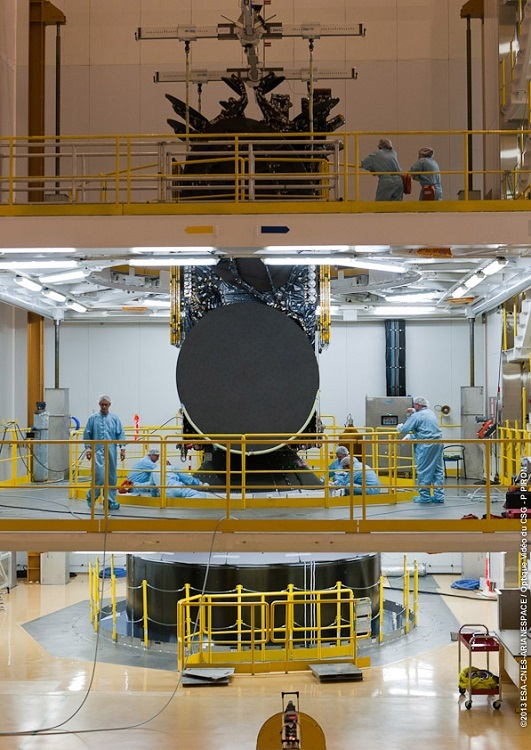 The EUTELSAT 25B/Es’hail 1 satellite is ready for its integration on SYLDA, and is installed atop the dispenser in Ariane 5’s Final Assembly Building. The heavy-lift Ariane 5 for Arianespace’s August 29 mission is now complete at the Spaceport in French Guiana following integration of its second passenger – the EUTELSAT 25B/Es’hail 1 satellite. Encapsulated in an ogive-shaped payload fairing, EUTELSAT 25B/Es’hail 1 and the SYLDA dispenser system on which it is installed were lowered over GSAT-7 – which was mated with the Ariane 5 earlier this month – to finish launcher build-up at the Spaceport’s Final Assembly Building. With both satellites now installed, Ariane 5 is ready for the final pre-flight preparations – including the launch readiness review on August 27, followed by its rollout to the launch zone the next day, and the subsequent countdown to a 50-minute launch window that opens at 5:30 p.m. local time in French Guiana on August 29. Riding in the upper position of the payload “stack,” EUTELSAT 25B/Es’hail 1 will be deployed first, at approximately 27 minutes after liftoff. Once in orbit, the spacecraft will be used by European telecommunications operator Eutelsat Communications and Qatar’s Es’hailSat Satellite Company to deliver television broadcasting, telecommunications and government services in the Ku-band range, while its Ka-band capability will open business opportunities for both operators. This high-power, multi-mission relay platform was built by Space Systems/Loral (SSL) and will be positioned at 25.5 deg. East, with a design life of 15 years or more. Following the release of EUTELSAT 25B/Es’hail 1, GSAT-7 – the mission’s lower passenger – will be deployed at 34 minutes after liftoff, completing the delivery of this Ariane 5’s payloads into geostationary transfer orbit. The Indian satellite, developed by the nation’s Indian Space Research Organisation (ISRO) space agency, will provide relay capacity in UHF, S-band, C-band and Ku-band from an orbital position of 74 deg. East during its design life of seven years. Designated Ariane Flight VA215 in the company’s launcher family numbering system, this mission represents the 215th flight of an Ariane-series vehicle, as well as the fourth Ariane 5 liftoff in 2013. The “upper composite” – with EUTELSAT 25B/Es’hail 1 and the SYLDA dispenser system encapsulated in Ariane 5’s payload fairing – was lowered over GSAT-7 during activity in the Spaceport’s launcher Final Assembly Building. Indian Space Research Organisation (ISRO) is gearing up for its next mission --- the launch of naval defence satellite GSAT 7 --- even as the revised launch dates for the aborted GSLV D5 mission are yet to be announced. The GSAT 7 or INSAT 4F is primarily meant for the use of the Indian Navy and other armed forces. It will cater to their telecommunication needs. According to ISRO, the satellite is configured to provide a wide range of spectrum ranging from low bit rate voice to high bit rate data communication. The satellite with a service life of 15 years will provide communication capabilities to users over a wide oceanic region as well as the Indian subcontinent. The satellite will be launched by the European space company Arianespace from its launch facility in Kourou, French Guiana between 2 to 2.50 am (Indian Standard Time) on August 30. The Ariane 5 launch vehicle will also have on board the EUTELSAT 25B/E. The GSAT 7 is expected to deploy the second around 34 minutes after the liftoff. Arianespace on Saturday said that the integration of both payloads were complete and the final pre-flight preperations were on. This will be followed by a final launch readiness review on August 27. The ISRO also announced the turning on of payloads aboard the INSAT 3D satellite which was recently launched by Arianespace. The satellite had developed some anomalies and resulted in terse moments for the ISRO’s scientists as they coaxed it to its preset orbit. An inquiry has been ordered into the same. However, the initial products from the satellite have already started coming in, the ISRO stated. 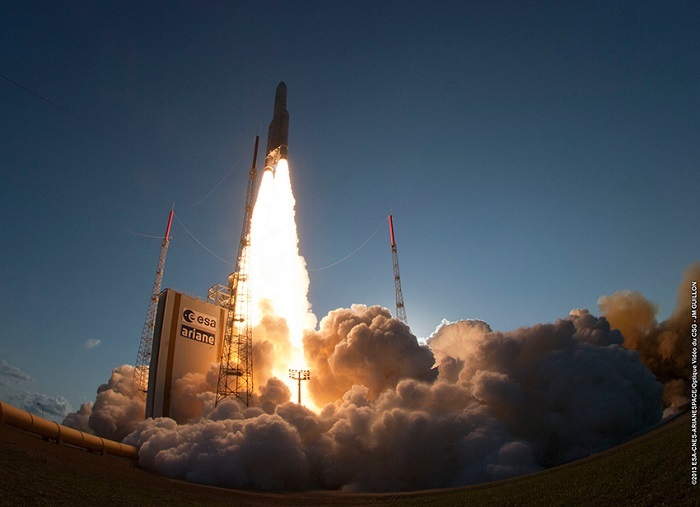 Arianespace launch VA215 - Mission accomplished! On Thursday, August 29, Arianespace carried out the 57th successful Ariane 5 launch in a row, orbiting two telecommunications satellites: EUTELSAT 25B/Es’hail 1 for the Qatari and European operators, Es’hailSat and Eutelsat, and GSAT-7 for the Indian Space Research Organisation (ISRO). Fourth Ariane 5 launch in 2013, 57th success in a row: Arianespace continues to offer the world's most reliable launch service! Today's successful mission, the 57th in a row for the European launcher, once again proves the reliability and availability of the Ariane 5 launch system. It also confirms that Arianespace continues to set the standard for guaranteed access to space for all operators, including national and international space agencies, private industry and governments. Following the announcement of the orbital injection of the EUTELSAT 25B/Es'hail 1 and GSAT-7 satellites, Arianespace Chairman and CEO Stéphane Israël said: "The 57th successful launch in a row of Ariane 5, the 80th for our family of the Ariane 5, Soyuz and Vega launchers, once again confirms the unrivaled reliability of our launch systems. I would like to thank Astrium, as the industrial prime contractor for Ariane 5, along with all other manufacturers involved, and the CNES teams at the Guiana Space Center, for working with us to make this achievement possible. On behalf of everybody at Arianespace, I would like to express our pride this evening in rising to the challenge of meeting the requirements of our three customers, Es'hailSat, Eutelsat and ISRO. Es'hailSat, like 80% of all new players in the telecommunications satellite market, chose Arianespace to orbit their first satellite. I realize that this is a particularly important moment for Es'hailSat, and for its CEO, Ali Ahmed al-Kuwari. Eutelsat and ISRO are both long-standing partners to Arianespace, reaching back over 30 years, and they continue to entrust us with their satellites year after year, within the scope of partnerships that truly honor us. I would like to express my sincere thanks to both of these companies; this latest successful launch shows that they made the right choice by selecting Arianespace! I would also like to personally thank Michel de Rosen, CEO of Eutelsat, and S.K. Shivakumas, Director of the ISRO Satellite Centre, for sharing this launch with us. And last but not least, I would like to thank Nicole Bricq, French Minister of Foreign Trade, and Her Excellency Dr. Hessa Al-Jaber, Qatari Minister for Information and Communication Technology, for kindly agreeing to join us this evening in the Jupiter control room at the Guiana Space Center." The two passengers carried on Arianespace’s August 29 success with Ariane 5 – EUTELSAT 25B/Es’hail 1 and GSAT-7 – were placed into a highly accurate geostationary transfer orbit by the heavy-lift launcher, preparing these spacecraft for their useful operational lifetimes. - Perigee: 249.3 km. for a target of 249.3 km. - Apogee: 35,942 km. for a target of 35,924 km. - Inclination: 3.48 deg. for a target of 3.50 deg. Further confirmation of the on-target deliveries by Ariane 5 came from Arianespace’s customers. India’s national Indian Space Research Organisation space agency, which developed GSAT-7, today announced that Ariane 5 precisely placed the communications satellite into its intended geostationary transfer orbit. In addition, ISRO stated that GSAT-7’s solar panels have been successfully deployed and are generating power, and that initial checks indicated normal health. During the next steps, GSAT-7’s liquid apogee motor will raise the satellite to geostationary orbit by September 4 with three orbit raising maneuvers. GSAT-7 ultimately will be positioned at an orbital slot of 74 deg. East, from which it will provide India with UHF, S-band, C-band and Ku-band relay capacity over the country’s land mass. In another statement issued today, Eutelsat Communications and Es’hailSat confirmed their jointly-owned EUTELSAT 25B/Es’hail 1 high-power relay platform also was on course for geostationary orbit. The spacecraft’s solar panels were deployed within four hours of separation with Ariane 5, and preparations rapidly commenced for the first of four apogee motor firings to raise EUTELSAT 25B/Es’hail 1 to its intended orbital position – 25.5 deg. East – for a planned service entry at the end of October. Once in its final orbital slot, EUTELSAT 25B/Es’hail 1 – which was built by Space Systems/Loral (SSL) – will deliver Ku-band television broadcasting, telecommunications and government services for the Middle East, North Africa and Central Asia; while the satellite’s Ka-band capability will open business opportunities in these regions for both of its operators. Yesterday’s launch marked the 57th consecutive success for Arianespace’s Ariane 5, as well as the workhorse vehicle’s fourth flight conducted so far during 2013 – delivering seven spacecraft with a combined total payload lift performance of more than 50,000 kg. The mission’s launcher was the 14th Ariane 5 ECA version delivered to Arianespace as part of the PB production batch from Astrium Space Transportation – the industrial prime contractor and integrator. The PB production contract was signed in 2009 to ensure the continuity of Arianespace’s launch services and consists of 35 Ariane 5 ECA launchers – covering the timeframe from 2010 to 2016. It follows the PA production batch, which involved 30 Ariane 5s.